I love grilling dead animals on a stick. It’s my most sadistic past time, but I love it so. The other night I picked up a 3/4 pound cod filet and did just that. 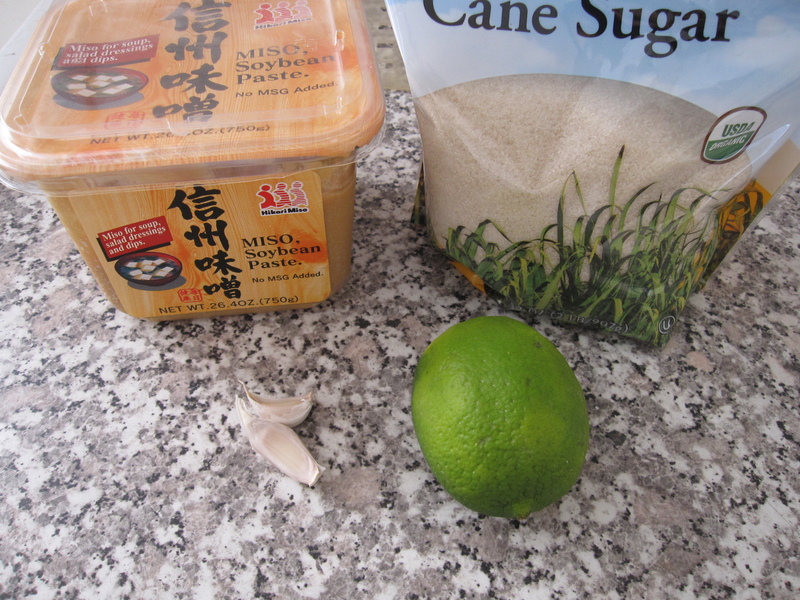 I mixed together 2 tablespoons of shiro miso, 2 minced garlic cloves, 1 teaspoon of pure cane sugar, and both the zest and juice of 1 lime. While mixing that together into a smooth paste I decided to pour in about 1-2 tablespoons of sesame oil to add a bit of nuttiness. I cut up the cod into bite-sized morsels and tossed them in the marinade. While the cod was taking a miso bath I made a tomato and bread soup. 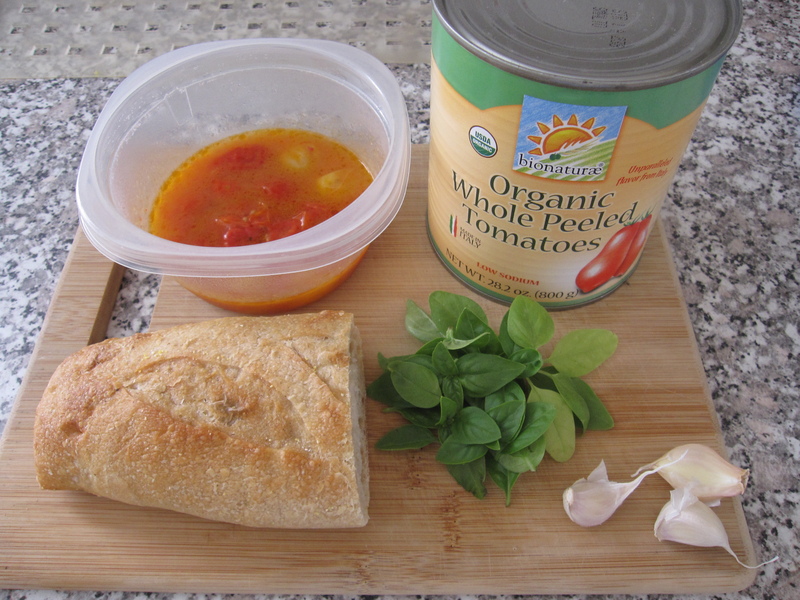 I used the leftover roasted cherry tomatoes with their juice from the night before, the crusty bread left from the night before, a 28 oz can of whole peeled tomatoes, a handful of basil from my back porch, and 3 garlic cloves diced. In a hot pan I poured in about 3 tablespoons of olive oil and then added the garlic and the stems from the basil. Once that garlic started to color a bit, about 1 minute or so, I poured in the can of tomatoes. You need to be careful with that because the tomato juice will splatter. Then I filled the empty can with water and poured that in. I let it come to a boil and then simmer down for about 15 minutes. At that point it’s pretty easy to break down the tomatoes with the back of a wooden spoon. After the tomatoes were completely broken down I poured in the roasted cherry tomatoes, bread, and basil and then seasoned with salt and pepper. I let that simmer together for about 10 minutes or so. Before serving I mixed in another little glug of olive oil. To skewer with the cod I chopped up a red bell pepper, half an onion, and the last handful of brussel sprouts from my fridge (I’ve never skewered brussel sprouts before, they’re quite nice as long as they’re cooked enough). 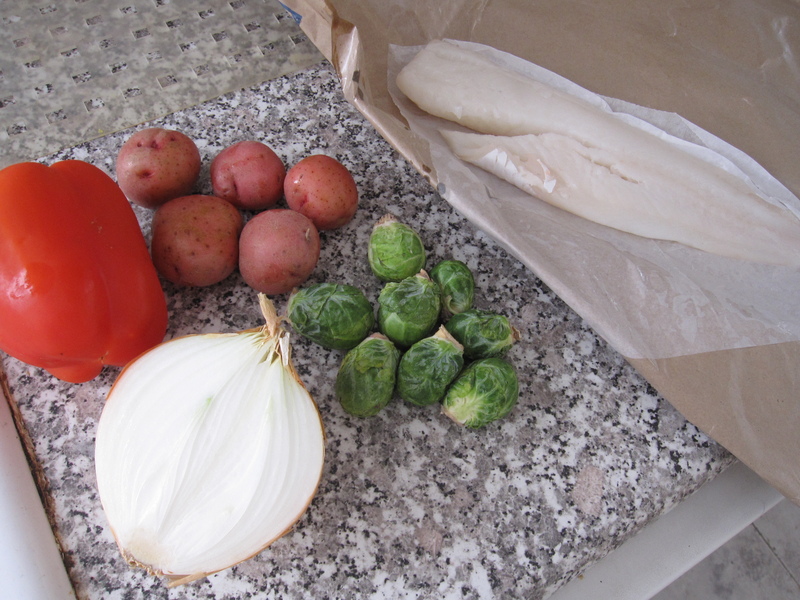 I also picked up 5 little red creamer potatoes to grill alongside. 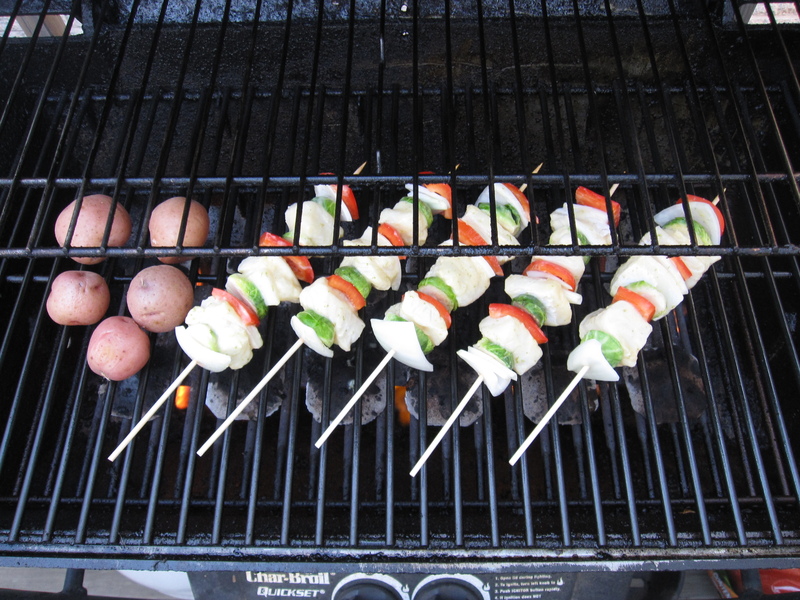 I skewered it all up and threw it all on the grill. 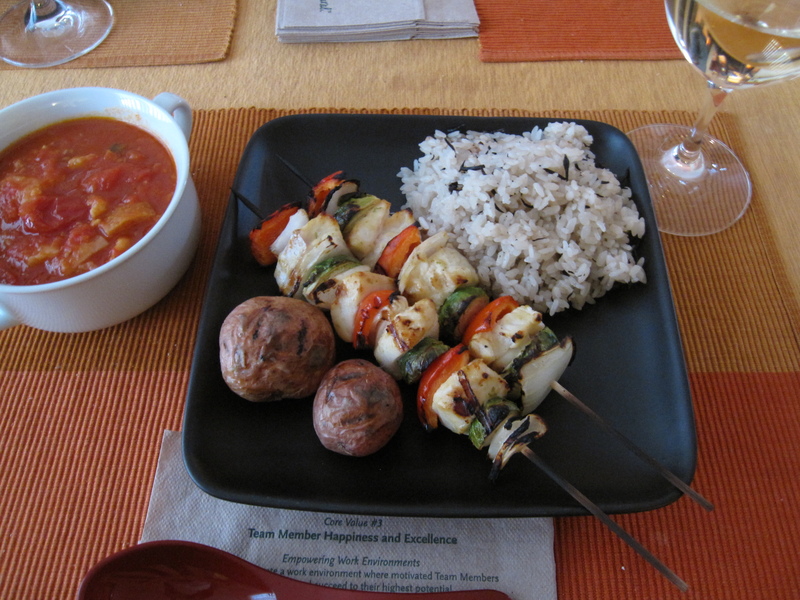 I let the skewers go for about 4-5 minutes on each side. The potatoes needed about 7 or 8 minutes on each side as my grill was about medium-high. After I rinsed the rice and put it in the rice cooker I decided to throw a tablespoon of dried hijiki seaweed in with it. I just dropped it in and let it sit in the water with the rice for about a half hour before turning on the rice cooker. It’s hard to describe the flavor of hijiki on its own. It’s kind of earthy and mushroomy which is weird because I struggle to call anything from the sea “earthy”. It’s really just umami. Damn delicious! My only mistake was not reserving some of the marinade. The potatoes weren’t as sweet as I had hoped and I would have been much better off smashing them after grilling and topping with some of the miso. Other than that I did well.